Can we recover from this tragedy? The aquaponics system has been producing food for us for almost 2 years already and I couldn't be more happy with it. However, I have had my share of issues with the fish! 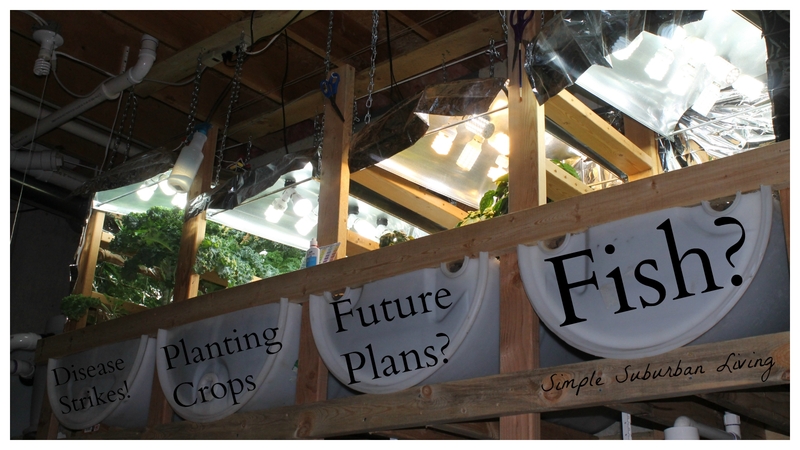 Here is an update on the aquaponics system and a few thoughts on a future revamp of the entire system. Summer is coming to an end and I can finally get back down into this system! Early this spring I purchased 30 Tilapia from an online company. I couldn't have been happier with the support I received from them and I am in no way blaming that company for the issues I have had. However, I added the Tilapia to the system in a separate (but connected to the system) tank and they slowly all died off. I tried to raise temps and meticulously checked water quality and could not figure out why they didn't make it, not one single one. they only thing I could come up with at the time was that the water was too cold (about 70-75 degrees) for the Blue Tilapia which do like warmer temps especially when they are young. So I shook it off and kept moving forward, planning to add some new fish later in the summer once outdoor gardening season died down. At this time I had about 70 goldfish in the other barrel and they were doing their job nicely eating up the food and fertilizing the aquaponics garden through the various natural processes that take place. Each day I would go down to the system to add the daily allotment of flakes and on occasion find a dead fish. This continued on throughout the summer with the fish population getting down to less than 15 by August. I again, kept checking the water quality, did not add any supplements, kept feeding regular, and moved fish between the barrels to see if there was some issue in the tanks with no result. At this point I have come to the conclusion that there was a disease introduced into the system by the Tilapia that slowly killed off all of the fish, I just can't come up with any other reasonable theory that makes sense. But the beauty of the aquaponics system is that it is so forgiving and still chugging along using up the residual nitrates and nutrients in the water and producing excellent Kale, Rosemary, Cilantro, Lettuce, and pepper for us. And now it is time to look to the future, to a cold Michigan winter where I can spend my evenings tinkering, redesigning, and rebuilding a new and improved version of the indoor aquaponics system. I plan to incorporate all I have learned into a more efficient, sleeker, easier to use system that will hold more fish and eventually incorporate so nifty new design features and grow beds. Stay tuned for more on that but for now, pray for our tough little goldfish workers that laid down their lives in the pursuit of fresh vegetables and in the name of science! Same issue, from now on I'm going to treat all new fish before introducing them into the system. I may also look to adding a sand filter. The swirl filter is nice but I think the sand filter may help with the cleanliness of the water. Very happy with my newest purchase. I hooked it up about 2 days ago and it brought my ambient temperature down to 73 degrees. Absolutely amazed, no ventalation necessary.